Voyage from your home berth to the picturesque, fishing port of Puerto de Andratx. Here you can explore traditional cuisine fresh from the ocean or simply sit back and watch the daily hustle and bustle of busy maritime life, in what is considered to be the most beautiful port in the Mediterranean. 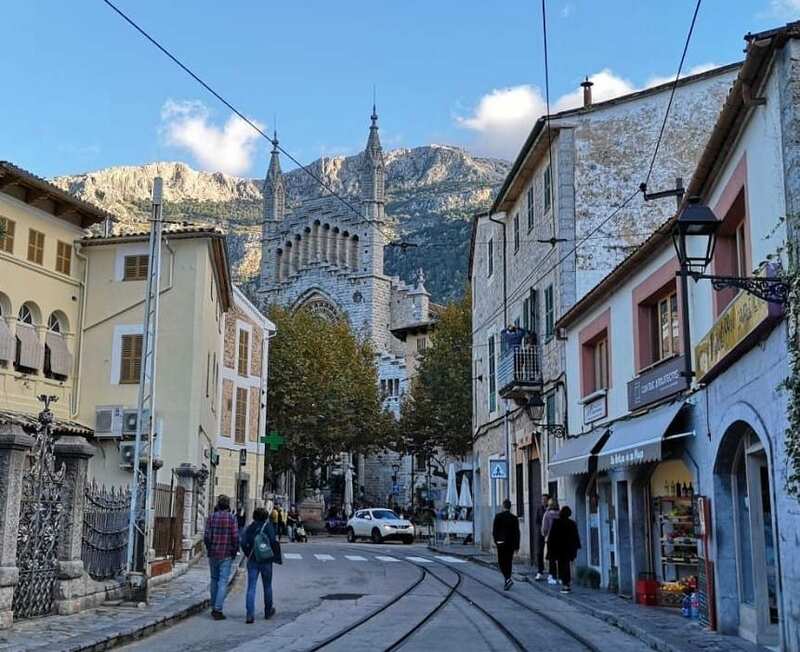 After an evening spent in Puerto de Andratx, you can cruise on towards Port de Soller, a charming coastal village on the west coast of Mallorca rich in architectural heritage. This seaside retreat was, until recently, one of the island’s best kept secrets. Take time out to relax on the pristine sandy beaches or wander through the village to discover boutique shops, cafes and restaurants; why not take a ride on the vintage tram on a picturesque journey among lemon and olive groves. In order to really make the most of your time in Pollensa, we recommend staying for at least two nights. Surrounded by picturesque mountains lies this family-friendly resort, with long stretches of sandy beaches lined with palm trees and a splendid array of cafes, restaurants and historic attractions. For those who may be cycling enthusiasts, there is a diverse range of cycling routes between Port de Pollensa and Alcudia, giving a fantastic opportunity to see the undisturbed mountainous landscape. 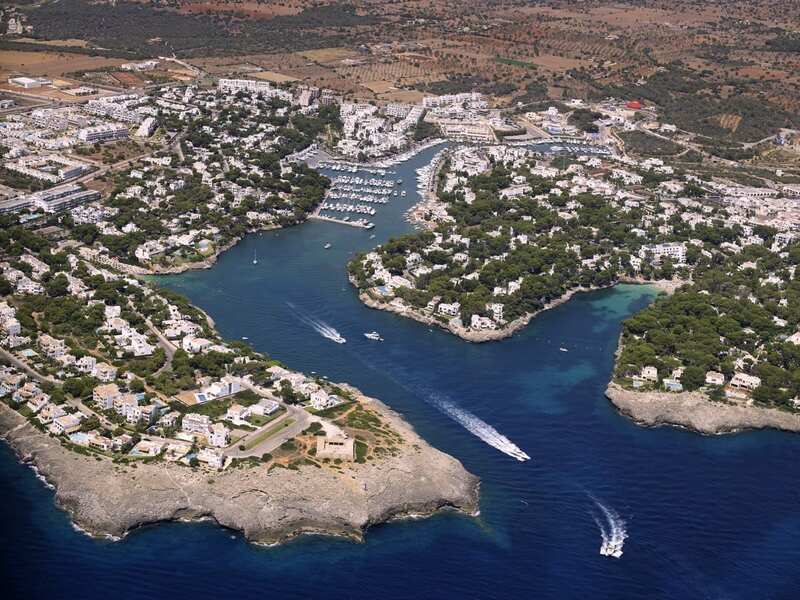 Known as the ‘Golden Bay’, Cala D’Or is a popular beach resort along the south east coast of Mallorca and is arguably one of the larger and more luxurious marinas on the island. The well-preserved nature and numerous small scenic coves of this coastline is worth exploring, ideal if you’re into your watersports. The resort itself is abundant with traditional white-washed facades in idyllic streets lined with pine trees, encompassing typical Ibicencan architectural style. Take a break from the tourist crowds of Mallorca and escape to the island of Cabrera; a well-kept secret by the locals, Cabrera is an unhabited island where the landscape remains undisturbed for centuries. Here, you can truly kick back and relax in total tranquility surrounded by a secluded oasis of turquoise blue waters and a natural abundance of marine wildlife. 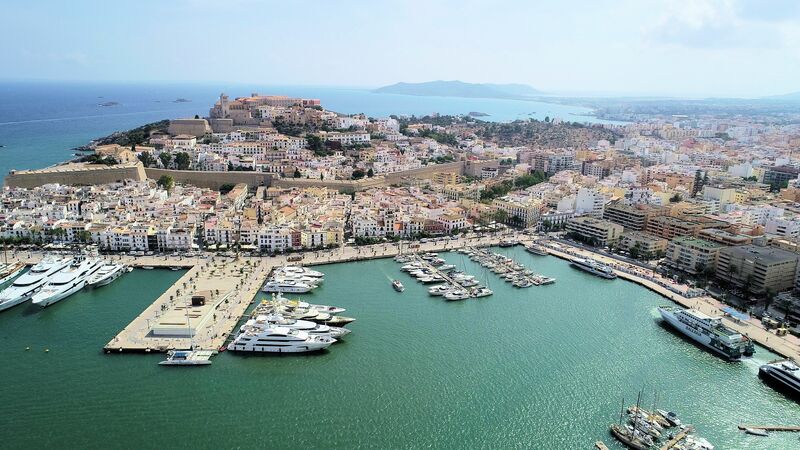 Choose to either spend more time on the remote island of Cabrera, or journey onward towards Marina Ibiza to spent two nights in this cosmopolitan port. The marina itself is quite a spectacle, attracting large superyachts as well as small local sailing boats, plus with a fantastic range of buzzing clubs and traditional restaurants you won’t be left short on things to do. From Marina Ibiza, you can visit two of the most iconic destinations nearby renowned for their tranquil beaches and undisturbed landscapes. Soft sands, crystal clear waters, buzzing beach bars; Las Salinas is truly an idyllic setting, as well as the unspoilt sandy beaches, it is also surrounded by the Salinas Natural Park perfect for long walks. 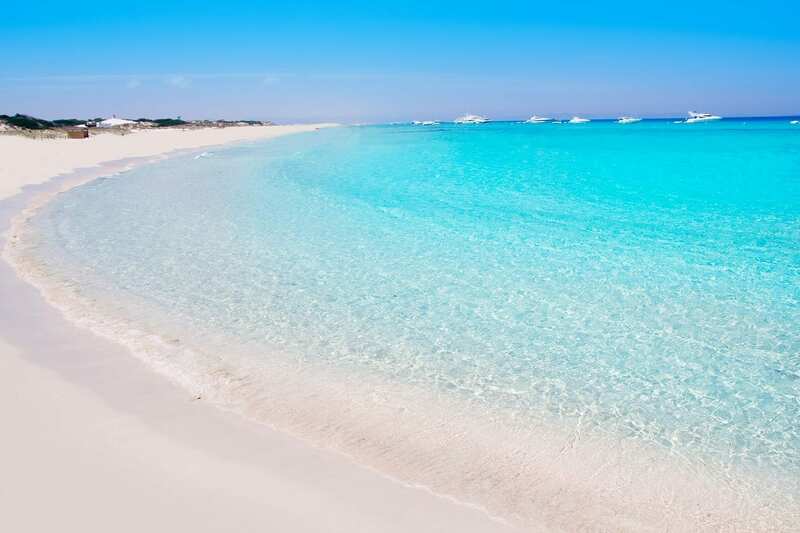 Why not stop off at Formentera – a true Mediterranean paradise, this blissful and bohemian island is the ultimate haven for those seeking peace and quiet. If you can pry yourself away from the white sand beaches of Formentera, we heartily recommend visiting the mysterious rocky island of Es Vedra; this uninhabited island is made mostly from limestone and is shrouded in myths and legends, the most popular being that it is the third most magnetic spot on earth. There is certainly a magical ambience surrounding this destination, and one which is best enjoyed at dusk or dawn so make sure to set your alarms for the perfect photo opportunity. Lying on the west coast of Ibiza, Sant Antoni de Portmany is well-known for its lively nightlife being situated on San Antonio Bay. Let your hair down in one of the many bars and clubs, soaking up the buzzing atmosphere surrounding this town. Before you head out into the town, don’t forget to take in the beautiful undisturbed sunset from your flybridge. 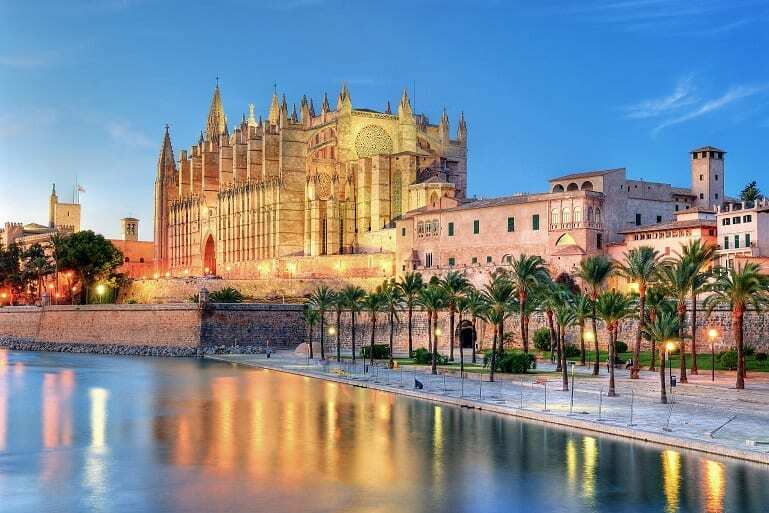 One of the more popular destinations to cruise to in Mallorca, Palma is rich in culture, entertainment and gastronomy. Whether you want to relax by the marina or explore the historic streets on foot, there is something for everyone in this charming capital city. Enjoy your final cruising day of your itinerary; why not treat yourself and wake up late, soaking in the tranquil views and reminiscing on the unforgettable memories.